As of today, the new ASUS Transformer TF300 tablet is on sale. Or as least, that’s what ‘they’ say. 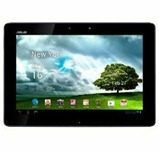 The Transformer TF300 is basically a somewhat less expensive version of the Asus Transformer Prime. They both have 10.1 inch touchscreens. They both run Android 4.0 (Ice Cream Sandwich) – the TF300 comes with a loaded, the Transformer Prime is updatable to Android 4.0. They each have a 1.2MP front camera and 8MP auto-focus rear camera. They both have an optional keyboard dock that costs $150. So what’s the difference? Well, about $100. The new TF300 will run a shopper back about $380 (base price). The Prime runs about $500. For the savings trade off, shoppers will get a slightly heavier tablet with the TF300 (about 1/10 of a pound more).. The body is plastic rather than metal, and is somewhat thicker. And there’s a bit less processing power in the Transformer TF300, but not by much. The $380 model has 16 GB of storage. There’s also a 32 GB version available for $400. In case you’re considering getting a TF300 and using it with a Transformer Prime keyboard dock, ASUS says they won’t be compatible. According to ASUS, the Transformer TF300 is available online now and will be in stores on April 30. Amazon has it listed as going on sale today – but says on their site that it usually ships in “8 to 9 days.” Hmmm. As of Sunday evening, the Transformer TF300 is not listed yet on BestBuy.com or any of the other major online retailers we checked. What’s going on with the launch here? Post your thoughts below.